Arsenal midfielder Granit Xhaka has been very impressive for the gunners this season and current reports claim that the Swiss international has attracted interest from Serie A side Inter Milan who will be hoping to strengthen their squad in the upcoming summer transfer window. Granit Xhaka joined Arsenal in 2016 for a fee reported to be £35million and Football Italia quoting Corriere dello Sport claims that Inter Milan are interested in signing the former Borussia Mönchengladbach star. Granit Xhaka has been playing in the Premier League for three years now and even though the Arsenal fans do despise him sometimes but have also sometimes admitted that they missed him in some matches which he did not participate in. 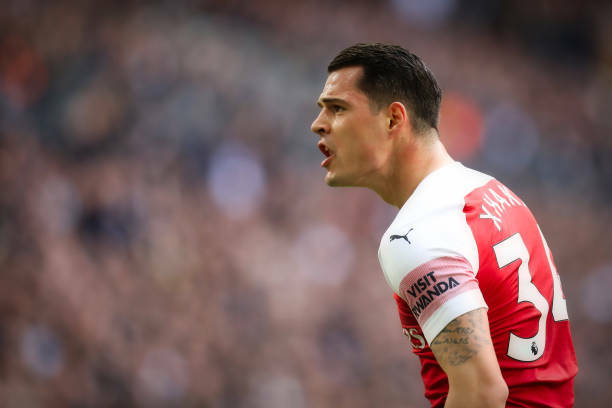 It would be interesting to see if Inter Milan would be able to convince Granit Xhaka to leave Arsenal to join them when he has just signed a new deal which would see him leave the Emirates Stadium in 2023. Inter Milan have sometimes also been linked with a move for Mesut Ozil in the past but interest in Granit Xhaka seems more realistic because the Swiss midfielder is still young and would be a great addition to their squad. Granit Xhaka has started almost all matches this season when he is fully fit and this means that Unai Emery trusts him, so it wouldn’t make any sense for him to just let him go. Mohamed Elneny is the central midfielder that is likely to leave Arsenal at the end of this season.